Life doesn’t always go to plan – but there are easy steps you can take to keep things on track for your business. The sad fact is that a lot of businesses underestimate the importance of taking these steps. Don’t be one of them. 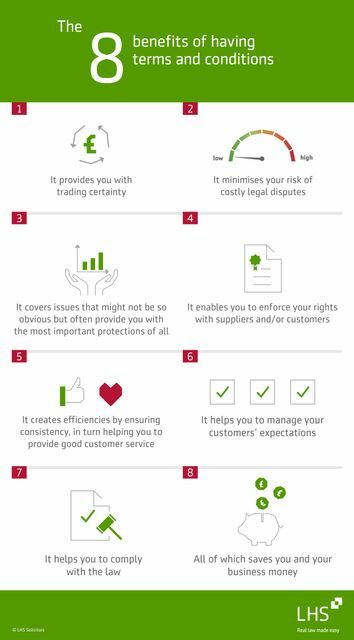 Having the right terms and conditions in place for your business is one of the critical safeguards that you should have in place from the moment that you first start trading. Keeping them up to date and ensuring they’re still relevant is also important, as your business grows and evolves. All of which saves you and your business money. The attached read also includes a free and easy to follow checklist so you can double check for yourself whether the terms that you’re using are properly protecting your business. For a friendly chat and fixed quotes, we’re here to help. To find out more give us a call on 0345 351 0025 or you can use any of the contact solutions, including livechat, on our site. You're on our blog and updates site, which is hosted by elXtr, a leading digital hub for business and legal solutions powered by the award-winning lawyers at LHS Solicitors LLP. Bringing you real law, made easy. It doesn’t matter what line of business you’re in, or how big or small you are, the well-used warning that ‘devils lurk in the detail’ applies equally to you – never more so than when it comes to the deals that you make, or more specifically, the terms on which you make them.